Christie® projectors played a crucial role at Singapore’s 50th birthday celebrations by providing spectacular visuals that captivated tens of thousands of spectators who attended the festivities on August 9, 2015. The stunning projection mapping performances were planned and executed by Christie’s rental staging partner Hexogon Solution Pte Ltd at three locations: the Padang (venue of the National Day Parade), the world famous Sentosa Merlion and the iconic Fullerton Hotel. More than 120 Christie projectors comprising the Boxer 4K30 and Roadster HD20K-J displayed rich and colorful multimedia content, including 3D effects, that enhanced the scale and grandeur of the celebrations befitting of Singapore’s Golden Jubilee, also known as SG50. This is the first time Christie Boxer 4K30 projectors were used for a national event in Singapore since launching in January 2015. For the National Day Parade, 64 Christie Boxer 4K30s were installed above the National Gallery of Singapore, creating a 100-meter by 70-meter canvas on the performance floor. Besides displaying visual contents exceeding 4K resolution, the clarity and brilliance of the images allowed the team from Hexogon Solution to create beautiful motion graphics that complemented the movements of the 3,500 performers on the two-tiered stage. As part of the SG50 celebrations, Hexogon Solution also deployed four Boxer 4K30 projectors in portrait mode to deliver an amazing eight-minute projection mapping show on the façade of the gigantic Sentosa Merlion. The hourly performance runs nightly from August 1-31. “Due to the 4K resolution offered by the Boxer 4K30s, we no longer have to stitch four images into one, like what we did in the past. The omnidirectional capability of the Boxer 4K30 provided us with much flexibility during installation and we are now able to project a complete image onto the entire Merlion sculpture and with a much higher resolution than before,” Goh noted. 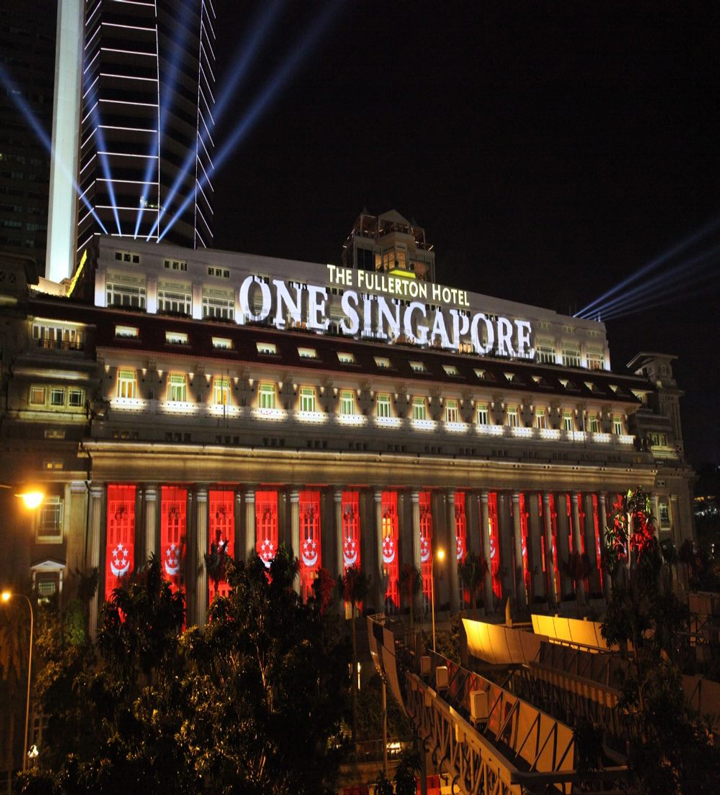 On the Fullerton Hotel’s enormous facade at Marina Bay, Hexogon Solution used 53 Roadster HD20K-J projectors for the projection mapping shows – extending the National Day festivities beyond the Padang, where the first NDP was held in 1966. The eight-minute spectacle, performed hourly every night from August 1-9, featured milestones of Singapore’s history that took place in the civic district. Ten award-winning Christie Pandoras Box Media Servers, renowned for creating compelling large-scale, multimedia experiences, drove all show content displayed by the projectors. The result was a mesmerizing National Day Parade and grand finale with projection contents synchronized across all three locations in a splash of splendid colors using the National Flag and SG50 logo as the main motifs. And at exactly 8:15 p.m., Singaporeans island-wide rallied together to recite the National Pledge – a moment that touched the hearts of all citizens as everyone pledged themselves anew as one united people.